Buenos Aires. When President Hugo Chávez of Venezuela died on March 5 his political ally president Cristina Fernández de Kirchner of Argentina arrived within 24 hours to show her respects. However, she then returned to Buenos Aires the next day, on March 7, and didn't attend Chávez’s funeral. This caused some pundits in her home country to opine that she was either trying to distance herself from the legacy of the deceased socialist leader, or that she feared being upstaged by Iran’s Mahmoud Ahmadinejad, another friend of Chávez. Either way, back at home problems were mounting: inflation was on the rise, and the country’s two main right-of-center newspapers, La Nacion and Clarín, were maintaining their critical stance against the Peronist president. Then, Kirchner got very lucky (or, for some, perhaps a minor miracle occurred): the archbishops of the Catholic Church, in their wisdom, picked an Argentine, Jorge Mario Bergoglio, to be Pope Francis (Francisco). The president, a devout Catholic, didn’t waste much time getting herself to Rome to pay her respects. And the conservative press was effectively muted. La Nacion, in the first eight pages of its March 18 print edition, had no fewer than 21 stories devoted to the Pope. In fact, there was only one story in those pages that did not cover Francisco, and that was about an airline losing money. 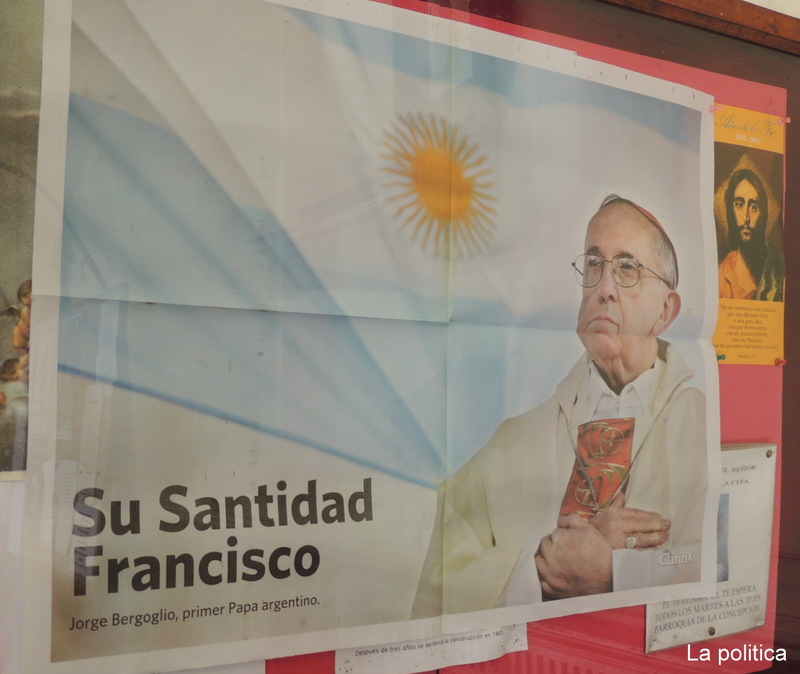 In Argentina these days – for some at least – it is all Pope, all the time. Kirchner is playing it for all it’s worth, giving the new Pope a yerba mate kit (like he doesn’t already have one? ), and holding an extended press conference in Rome expostulating on her audience with the new pontiff. Meanwhile, the pro-Catholic right-of-center press can only hold its breath until Kirchner returns home. Then it can get back to bashing the President for her autocratic ways, such as the fact that she has stopped all government advertising in La Nacion and Clarín, and has even gone so far as to use the threat of government investigations to discourage printers from serving the two large papers, particularly in rural areas. There are ill winds blowing in Argentina. Inflation is on the rise. Kirchner is ramping up the Falkland Islands/Malvinas issue. And Pope Francisco is facing questions regarding his role in the kidnapping by the military of two ex-priests during Argentina’s “dirty war”, though in La politica’s opinion Francisco's biggest challenge will come when the church in Latin America finally faces its own legacy of child sexual abuse and cover ups, as have congregations in Canada, the United States, and Europe.